Truth is, sales engagement platforms are more accessible and advanced than ever. Data is easily sourced. Companies are investing in Sales Development Rep education and growth. And, there is a thought-community developing to share insights and best practices. Today...Outbound Sales should be everyone's #1 customer acquisition channel. Regardless of industry, product, or decision maker. Sales Qualified Leads must be a priority and Outbound must be your focus. My assertion is not without justification. For the past two years, Leadium has become the leading Outbound Sales & Lead Generation Agency in the market. We set out with a goal of “productizing” outbound sales. To package employee caliber Sales Development Reps (SDRs), experienced Outbound Strategists, dedicated Data Researchers, actionable analytics and powerful technology. By “productizing” sales development, we have made Outbound Sales accessible and affordable to every business in the world. And, being able to quickly develop and deploy a strategic outbound program has resonated. We sourced over 2 million leads in over 64 industries including Software, Technology, Marketing, Pharmaceuticals, Real Estate, Food & Beverage, Managed Services and others. We created over $75M in revenue opportunity for hundreds of clients across 4 continents. And, we grew more than 400% year-over-year ourselves using the same outbound sales development program we so carefully customize for our clients every single day. We believe that the outsourced lead generation market is so much more than the constant prospecting emails you receive by vendors over promising inexpensive leads, pay-per-performance, or BPO models. We’ve adopted an “Agency” mantra. Where we are a full-service solution. From strategy to execution. It’s through our successes, we have developed comprehensive knowledge, insights, and data on Outbound Sales. We get the unique ability to test strategies and assumptions across hundreds of products, industries, and decision makers each month. And our conclusion is, that to continue to do the best for our clients we must make the Outbound Sales community as a whole, better. So in 2019, we are bringing what we have learned through our partnerships and client outbound programs to the community of marketing leaders, sales leaders, and business owners looking to start, optimize, or re-invent their Outbound Sales acquisition strategy. Coming to an inbox near you, we are also launching our bi-weekly newsletter, The Outbound Sale Pulse! This is for all of our valued clients, followers, and let’s be honest, our competitors, to get the latest industry tips & tactics, strategies, information, and podcast announcements in one single spot without having to go to all of our channels! The outbound frontlines are filled with more than motivational pep-talks and buzzword “marketing” books. So...Outbound Realities will become the only coffee table book made by SDRs for SDRs. We are injecting some comedy into our prospecting lives with hilarious, sad, and awkward first-hand stories, emails and lessons. 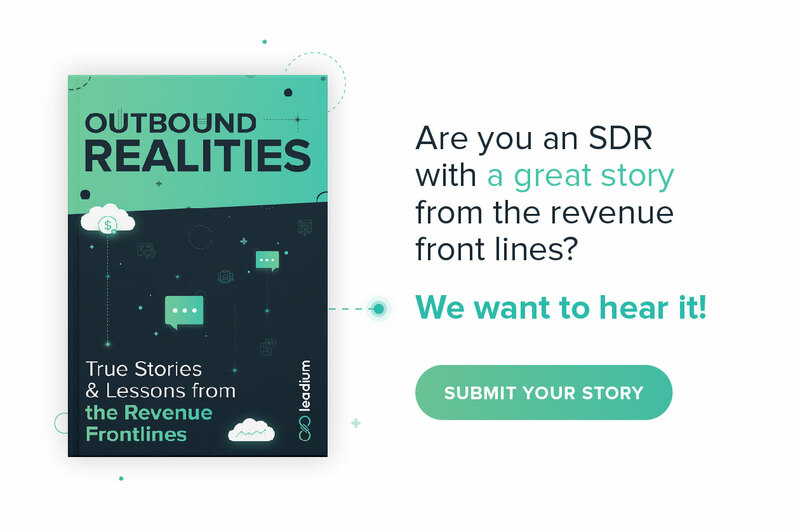 These stories will all be true-life and sourced from the Outbound Sales community. To bring together the highest quality lead data with strategic Outbound Sales programs, it takes a truly amazing team. Especially, to do it all at incredibly affordable prices. Leadium continues to be a company focused on connecting a talented global workforce to small businesses, startups, and Fortune 500s who are looking to accelerate their growth. Our sales and marketing professionals, just based on geography, don’t have the same opportunities. But, through a culture of fostering professional growth and quota crushing sales execution, our clients are finding that great talent doesn’t stop at our borders. We are starting this year sharing and talking in a big way and it’s for one reason - we are on a laser-focused mission to help any business of any size from any industry find prospects, automate outbound, and grow pipeline like they have never tried or imagined before. We want to be your go-to resource for outbound sales innovation and inspiration. Here’s to 2019 - the year of Outbound Sales.